Seeing the poor condition of the appliance shown in picture #1126,I thought this preserved Landrover deserved a viewing.This photo was taken at the Odiham Fire Show in Hampshire,England in 2006.Due to severe bad weather in 2007 the show was cancelled.The Odiham Fire Show(weather permitting)this year will take place on Sat 2nd/Sun 3rd August. Added by Fire995 on 02 June 2008. Frank, thanks for the added information, do you know where it was stationed?. Sorry I didn't reply to the E.Mail you sent, but will do in due course.Pete. Added by Pete Matten on 02 June 2008. No sorry Pete, that was the only info I had on her. Added by Fire995 on 03 June 2008. The base vehicle is another Land Rover Series 2B FC, not a 101. Added by David Sparkes on 18 June 2008. I also think it's a series 2 "110" FC. Added by Fire995 on 18 June 2008. 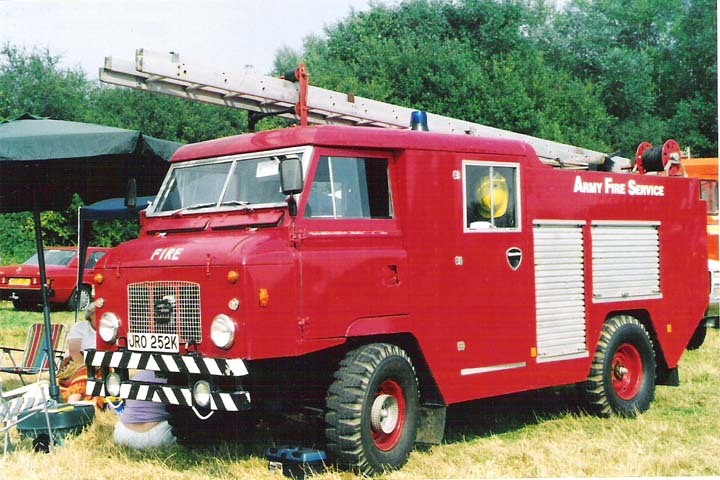 My fault, its a Landrover 110 Forward Control Water Tender.My old brigade had simular but with modifications made by Carmichael and Sons of Worcester and when first delivered back in 1971 to Midhurst in West Sussex, it was delivered in what became known as Coventry Yellow.A very unique appliance. Added by Pete Matten on 20 June 2008. Gents, this site may be useful, both in general terms, and because if you scroll down there is a link to a scan of a 4 page brochure, on which it is described as a 110 Forward Control. Add in the standard four letter sequence starting h, but you don't need the three letters starting w). Note how he covers all the options, 109 FC is the 2A, and 110 FC is the 2B. If you Internet search using '110 Forward Control' you will get a lot of hits. If you talk to a Land Rover person, and say 'One Ten', they will think you mean the later 110 Defender, which I suppose is why a lot of Land Rover people will give the Forward Control its unique designation of '2B Forward Control', a search term which also gets lots of responses in a Search Engine. Probably it's best to make sure the words 'Forward Control' are always included in the description, to have the best chance of avoiding confusion. Added by David Sparkes on 20 June 2008. Brings back memories this, we had one at RAF Saxa Vord in the seveties. In RAF use they were known as Firefly. We covered the whole island with it and generally it was well thought of. Ideal for rural cover and with a Godiva 650 gpm pump, if you were near water a decent amount. The 100 gall tank didnt go too far! Added by James whittaker on 20 February 2009. Iam looking for information on a 2b FC firefly, ex RAF ordinance factory, wonder if any one can help out??? Added by Justin on 23 June 2010. Have a look at picture #21162 and the comments posted. Added by Marcel Gommers on 23 June 2010. Added by Justin on 27 June 2010.